Important Note: This is an alternative version of this freelance request, phrased very differently. Our goal is the same. 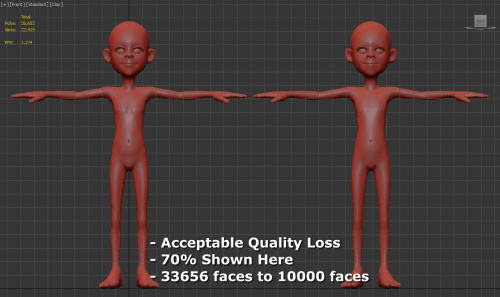 Currently we have character models that will work, but they are too high poly for use in our game. Only one of these two jobs will be funded. We’re planning to use some character models and clothing from Daz3D in a game. 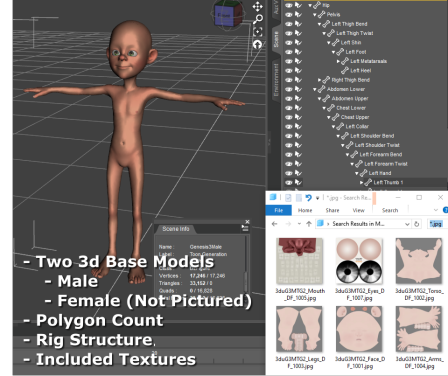 Daz provides almost everything we need: generic rigged male and female with customizable age, weight, etc. blendshapes plus a variety of outfits. The problem is that these are high poly models presumably meant for offline animations, not game-ready. 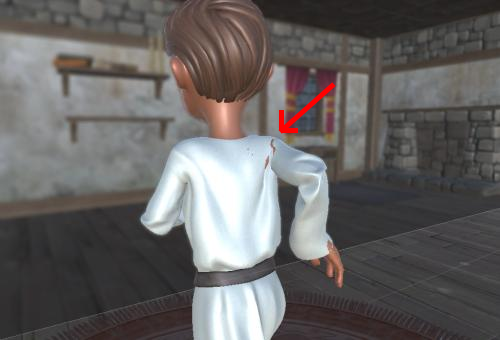 Also, when used in Unity, some parts of some clothes go through the character skin or other layers of the clothes. 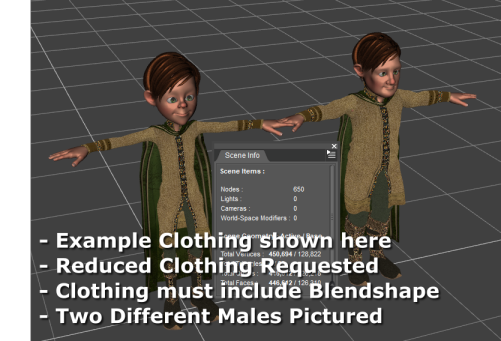 I’m looking for someone to decimate these character models and clothes and, if needed, tweak the clothes a bit to make sure they’re always outside skin. I’m told that will probably mean re-UV-ing and re-rigging afterwards. 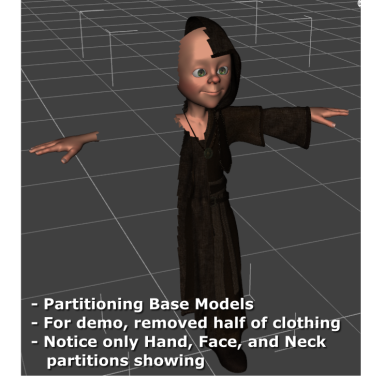 We also need to preserve the blendshapes for things like age and weight and the vertex attachments for the clothes. Basically, we want them to work just like they do now, but lower poly. We’ve tried the Daz automatic decimate plugin with no luck. I’m honestly not sure if that’s a competitive rate or not, but that’s what I’ve got to work with. This doesn't happen in a T pose; it happens during certain animations. If this ends up being too difficult to fix, we may explore other alternatives such as turning parts of the body mesh invisible when they're under clothes. The characters are roughly 35,000 polys and we need to bring them down to about 10,000. That's not a hard-and-fast number; I just want to give you an idea of how much loss we're going for. There are a total of 10 hair objects and 24 outfits, some more complex than others. Some outfits, especially the female dresses, have parts that hang off, and we're planning to use Unity's cloth system for those. As they stand (with 1000s of polys for a dress) the cloth system is very expensive to run and gives some odd behavior. The clothes also have attachments to the rigged bodies and blandshapes that match the age, weight, etc. of the bodies, and we need to preserve those. Thanks for reading, and please let me know if you have any questions.